Sent postward as the longest shot on the board at odds of 14-1, Lou Tucci’s two-year-old Wallace pulled off the upset winning the inaugural $100,000 Soaring Free Stakes in front-end fashion on Sunday afternoon at Woodbine Racetrack. Leaving out from the inside post with Emma-Jayne Wilson, the Sid Attard trainee set opening fractions of :24.01 and :47.32 en route to the 1-3/4 length victory over the yielding turf in 1:11.83 for approximately six furlongs. 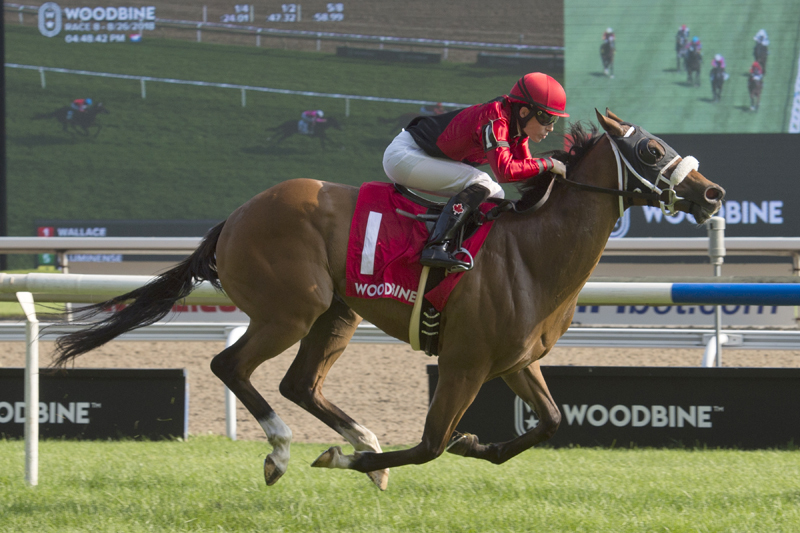 Supplemental entry Tricky Magician, one of three colts in the field from the Mark Casse barn, followed in second-place while 8-5 favourite Fluminense rallied from last to show in his Woodbine debut for trainer Steven Asmussen. Bred in Kentucky by Foundations Farm, the Run Away and Hide-Tales of Paradise gelding is now two-for-five in his career. After watching Wallace easily defeat another one of his two-year-olds on June 27 at Presque Isle Downs, Tucci purchased the bay gelding and sent him to Woodbine for the Victoria Stakes, where he finished fourth over the main track. With the addition of Lasix for the Soaring Free, Wallace cruised to his first stakes victory. Wallace rewarded his backers paying $31.90, $13 and $5.30. He combined with Tricky Magician ($6.90, $3.70) for a 1-2 exacta worth $155.50. A $1 trifecta of 1-2-5 (Fluminense, $2.80) returned $196.55 and a $1 superfecta of 1-2-5-4 (Muskoka Wonder) paid $644.10. Muskoka Wonder, Crawl From the Bar and Saints Marching In completed the order of finish. A new local prep for next month’s Grade 1 Summer Stakes, the Soaring Free is named for the Sam-Son Farm homebred who was inducted into the Canadian Horse Racing Hall of Fame in 2013. Trained by Mark Frostad, Soaring Free’s 2004 Horse of the Year campaign included a victory in Woodbine’s $1 million Atto Mile Stakes (Grade 1) and a seven-furlong turf track record performance.